As I slowly begin returning to painting landscapes the question of light arises. For most of my artistic career I have not been that interested in light in paintings, though I enjoy it in the works of other artists. However in landscape painting light is very important, so lately I've been examining the use of light by various landscapes painters, all of whom would be called "realists." What I found in closely studying their paintings is that they are not strict and mathematical, if you will, about where the light hits. In fact in many realist paintings – those of Andrew Wyeth come to mind – the light is very natural looking at a glance, but then upon closer examination is highly invented. I find nothing wrong with artists taking this liberty. The key to light in landscape painting seems to be to make an effort to simply include it in the work, and not obsess over where everything lines up and how it strikes each object in a uniform way... almost like a Bob Ross painting. Each object typically has a light area, a mid value, and a dark area. Get that right and the painting will take care of itself. The key is not worry so much about literally reproducing the exact way light strikes each object in succession. If one can do the and do it well, fine. But it is not necessary. The mathematics of how the light strikes is secondary to the presence of light itself. I have really been enjoying getting back into landscape painting. It is a quite a challenge for someone who has for so long painted in a rigid, geometric style. I've been doing a bunch a small studies in oil on canvas board to get back into practice. I've also been experimenting with landscape in egg tempera and doing some work that I think is good. Once again edge tempera proves itself to be a versatile and beautiful medium... no wonder Wyeth used it so much! The goal is to do a number of small egg tempera landscapes, and some in watercolor as I did about 12 years ago, and then to do some larger landscape paintings in oil on canvas. For some reason when I paint in oil I need to work larger. I am still working on my older stuff. Just recently I completed a very small icon commission of the Virgin and Child (picture below - sorry for the glare in the photo), and I am currently working on a largish icon of the Descent of Christ from the Cross. The Sunday school kids are fascinated by it! (I do my iconography at my office.. well, any egg tempera work, for that matter.) I also just completed a large oil painting of the Conversion of Saint Paul. Yesterday I began working on a graphite portrait of a horse, and soon I'll be taking on a commission to paint a large ship - that one will will probably be executed in watercolor, but I haven't decided yet. I'm really enjoying breaking out of my artistic habits - always painting one or two things/sticking with on for two subject matters. I am also enjoying getting back into watercolor, pencil and charcoal, and painting subject matter in oil and egg tempera that I have not done before. I am also hoping to do some work in pastel as well - a medium that I have little to no experience with, but yet somehow I have ended up with tons of soft and hard pastels in my studio! Might as well use them! After my summer show at the Liriodendron in Bel Air, MD I found myself incredibly burned out with everything - art, church, family, etc. - so I took a break from painting for a few months. I'm glad I did, because it helped me refocus and begin a much needed change of direction in my work. While I'm still going to paint the occasional icon I am going to try to do some landscape in egg tempera. I have only done two or three small such paintings in the past, but have always wanted to explore it more deeply. Andrew Wyeth's egg tempera landscapes are so compelling... not that mine will - or ever could - look like his. It is very versatile medium that allows for a lot of subtlety in a variety of ways. It will take a while to get up to speed with this, but I am looking forward to it. I already have one in progress. As for cityscapes - my former signature work - I am burned out with these, and currently so repulsed by Baltimore and what the idiotic leadership of this once great city have done to it over the past 50 years that I cannot find any wonder or attraction to even being there... much less painting pictures of it. My sacred art... this is tricky. All I can say is that I will be approaching this from a different technical angle, going back somewhat to earlier forms. Am currently working on a painting of the conversion of Saint Paul. Will keep you posted. This month my art show at the Liriodendron ends. I want to thank everyone who came out for it, and for all of the nice and interesting comments on my work. Many of the works were familiar to us as they have been gracing the walls of the parish hall and my office for some time. The history behind that is that we needed some decorations for the walls but did not have any money budgeted for that. So, in consultation with the vestry, it was agreed that I could hang my works in the parish hall on a temporary basis. This was always meant to be temporary. One of my professors in college, a sculptor, once told us that it is not good for an artist to be around his own work all the time. I would tend to agree with that. So after the show is over only one or two large pieces will return to the parish hall and maybe a couple of small icons. The work currently hanging in the parish hall is that of my late first cousin once removed, Noel Kavanaugh Edwards. Noel was an artist and naturalist based in Redding, CT. Over the years he created many wonderful pieces in all sorts of mediums (charcoal, graphite, oil, watercolor, etc.). I hope everyone enjoys looking at his art and feels closer to nature and God as a result. Some of the work will come down or be moved when a few pieces of mine return to the walls, so there should be a nice balance of art in the parish hall in a few weeks. We are also moving the bulletin boards back into the main portion of the parish hall. This is because I have noticed that many people do not make it over to the back end of the hall were they have been hanging, and so no one reads the vestry notes, financials, articles, diocesan news, and other announcements that are posted. Having the boards in the part of the hall were most of us gather to fellowship after services will hopefully get more people looking at this important stuff. The boards will have lettering put on them so we all know what is posted on them. One of the things that I will miss when most of my work leaves the walls of the parish hall is the fascinating questions and comments that I would get about them. In fact I think I got more comments about my art than my sermons! Some people would look at certain pieces, such as “The Triumphal Entry” and “Holy Trinity Enthroned With Saints,” and remark that a hand was in the wrong place, or that something was not correct spacially. It was very enjoyable for me to explain that the painting was supposed to look that way! Other people commented on how peaceful my painting “Virgin and Child Enthroned With Saints” made them feel. It was really great to hear so many great and wide and varying remarks about my work. What was also interesting was how some people only commented on the paintings when they were hung in the show - not when they were hung at church! This is a good indicator of how we look (or fail to look) at things. There is so much that we see in life that we think little to nothing of… and don’t even notice… because though we look at everything we often fail to truly see. This reminds us of what Jesus said about people having eyes but not seeing, or ears but not seeing. When I worked in stained glass restoration I’d occasionally point out a grossly bowed section of glass in need of repair to a client and more often than not they would say, “I never even noticed that! And I sit next to that window every Sunday!” Maybe the same thing was going on with my art. It was there in church every Sunday, but a lot of people - including myself at times! - didn’t really “see” it. But when it was in a gallery setting we all had a better chance to look at it a bit more closely. A lot of people laughed at me when I went off to study art years ago. “What are you going to do with that?” they asked. But studying art was one of the best decisions I ever made in my life. Art is not only a great mode of self-expression, it is a way of exploration into the human person, the world, and the nature of reality. It helps us better understand ourselves and the world… and as Christians, God. The prominent NYC-based figurative artist, Eric Fischl, speaks of painting in particular as being a primitive language. Language, as we know, is expressive. But it is also creative. The philosopher Martin Heidegger reminds us that language is “the house of being.” That is to say, language plays an important role in shaping our world and us - how we think, what we believe, etc. This is what the language of art does. It is not only a means of personal or even societal expression, it also shapes the world into which it emerges… one need only think of Picasso’s Guernica - his incredible mid-20th century commentary on the Spanish Civil War, which brought worldwide attention to that conflict. Pop culture entertainment, for better or worse, does the same thing. It pushes boundaries and reshapes our imaginations, assumptions, and narratives on any number of subjects. If that is what art in general does, and how powerful it is, then what does art that portrays images of our Lord, and other scenes from the Bible do? It keeps these narratives on the scene, as it were, and reinterprets them for a new age and generation in order to subtly but powerfully shape the weltanschauung (worldview) of alienated and despairing people in a postmodern world! Perhaps more Christians should take up painting. It is a most profound and rewarding practice, and one that has the potential to bring about much good in the world. Please come out to the Liriodendron in Bel Air, Maryland July 12th - August 9th to see my art. I'll be showing religious works consisting of icons and oil paintings. Most of the oil paintings will be quite large. The icons will vary in size, the largest being about 2' x 2' the smallest being just a couple of inches. Ten years ago I had a show at the Liriodendron and it was a big success. At the time a nice article about me was written in the Baltimore Sun... specifically about my iconography, which I had just started doing. The main difference between the last show and the upcoming one is that the former had cityscapes in it, while this new one will not. Once this show is over I will likely be taking a break from painting religious works in oil. I'd like to delve into landscape painting and still life, which I haven't done for years. Not only do I find that subject matter interesting, I also would like to market my work to companies, and quite frankly most companies - unless they are a church or church-related organization - are not interested in large-scale sacred works. Most people aren't in fact... when was the last time you went into someone's home and saw a massive painting of the crucifixion in their living room? I'll keep "writing" (painting) icons of course, as that is a small, reliable niche market, and because they are easier to sell, if no other reason than their size. I began painting most sacred works back in 2006/2007 after my ordination as a way to explore the mysteries of the my faith and ministry. Having created many beautiful works over the last 10 or so years, I feel comfortable moving on to something else. Recently I purchased Techniques of Icon and Wall Painting by Aidan Hart. Billed as the most comprehensive book on iconography in the English language, this book is everything it is chalked up to be and more. It does not disappoint! In addition to explaining the history, theology, and technique of iconography it does the same with wall painting - fresco and secco (painting onto a dry wall... not "drywall" per se [i.e. sheetrock] but literally a "dry" wall... as fresco is painted on a "wet" wall). This added feature definitely sets the book apart from others on the market. Aidan Hart is a world renowned iconographer who studied under some of the best teachers in Greece and Russia. In this book he addresses the theological and technical aspects of iconography in great detail. The photography and layout is extremely well done, and it has an extensive bibliography. It comes with recommendations from everyone from the Bishop of London to Prince Charles. Aidan Hart has done the English speaking world a great service by producing this book. As someone with an art degree who learned to paint icons through a book, observation, and lots and lots of practice, I have found this new Aidan Hart to be very affirming of some of my own techniques I've developed over the years. "Book learning" has obvious limitations, and one who learns something on his own through books always wonders in the back of his head if he is doing things right, or if the book or books he's learning from are accurate. So I was happy, for example, to discover that many of my own practices, such as drawing the composition directly on the panel as opposed to using transfer paper, slightly altering compositions by excluding certain figures, etc. 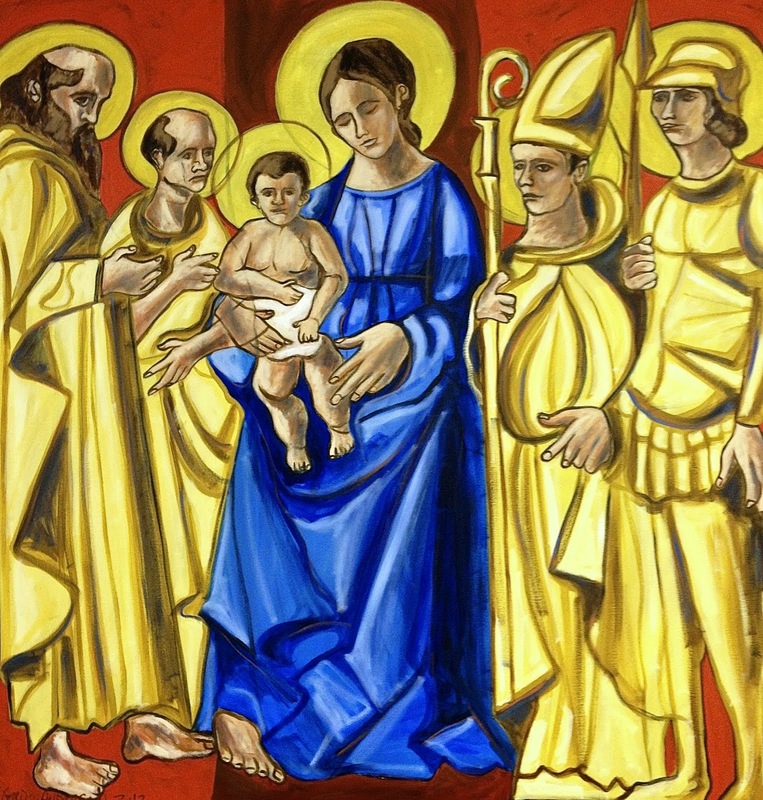 are perfectly acceptable techniques within mainstream iconography and are practiced by many iconographers. Of course, all one has to do is study the history of iconography and look at the work of various schools to see how wide and varied the practices and techniques are. It is the theory and theology is what remains unchanged. But in any case it is nice to have someone with talent and stature like Aidan Hart to articulate all of this variety within the tradition. I do not recommend this book for someone just starting out with iconography because I think he or she might find it overwhelming. Instead I would start out with a more basic book that has a few specific projects that can be done. The book by Guillem Ramos-Poqui is a great place to begin. Then, if you want to go deeper as I have, check out this book by Aidan Hart. It is a real treasure. I read this obituary about one of America's famous iconographers, Demetrios Dukas, and felt vindicated when I read this quote of his about icons: "It's a great art. It's a religious art, but it prefigures modern art. It has elements of Cubism, Expressionism, it has everything. … It's an art that transcends nationalities and speaks to everyone." A number of years back I had a show of some icons, religious works in oil, and cityscapes in South Carolina. One person who came out could not understand how I could have religious works and icons in the same show as my cityscapes, because the former are 'realistic' and the latter are very 'abstract'. I told him on the contrary that the religious art that I do - especially icons - are very abstract, so there was actually a lot of similarity between the pieces. He looked at me as though he didn't understand or agree. The quote above vindicated me in a sense, because icons especially contain all of the great elements and movements of art: realism, abstraction, Expressionism, Cubism, and more. I have always seen a great deal of continuity between iconography and the art of the undivided Church and "modern" art. Those who do not simply need to study art and art history a bit more! I am an artist and an Anglican priest. I pastor a small parish in Maryland. My daily struggle is to try to live with and reconcile two demanding (and sometimes competing) vocations: the vocation of the artist and the vocation of the priesthood.